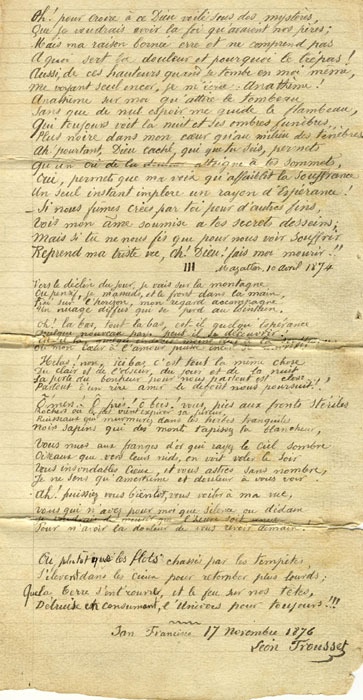 POEMS OF LÉON TROUSSET, WRITTEN IN HIS OWN HAND. And looking toward the horizon, is filled with doubt. His brow is worn by the passing of the years. He is drowsy; one would say he is dozing. The evening shadows are already deepening. Grasping his walking stick with the little strength remaining to him. Then falls to the ground, and it seems each breath will be his last. And at the water's edge, Zephyr murmurs! Tell, me, what are our tears to you? You prefer laughter. Crash on the shore one after another. I am like that traveler; my way has been hard. I am worn out and, above all, know not where I go. "I would like to sleep, never to awake." Too heavy is the burden of suffering I must endure. Encountering, alas, only cold indifference. For some time now my heart has grown accustomed to suffering. Just as a blacksmith's hands are hardened by working with iron. And have found only lies and scorn." There they remain, ready to come to life. A heaven shining through the blue of the sky. Oh! To be able to believe in a God veiled in mystery! How I long for the faith of our fathers! But my mind is incapable of understanding the reason for suffering and death. Realizing that I am still alone, I cry out, "Cursed! With no ray of hope to guide me. And in my heart, a night that is darker still. Allow a cry of pain to rise up to the heavens. To implore that you grant me, for a single instant, a ray of hope. Put an end to my miserable existence. Oh! God! As it disappears in the distance. Oh! far, far away, does Hope exist there? Is there some new country that has yet to be discovered? Oh! There! A place where suffering is felt less intensely? Where my heart could open itself up to love once more? Alas! No! every place on this earth is the same. Everywhere the door to happiness is closed to us. Everywhere we are haunted by the bitter laughter of disgust. "Oh! Seas! Oh! Fields! Oh! Woods! You! I feel only bitterness and sadness when I look upon you. So that I would not have to endure the pain of seeing you another day." Rise up to the heavens, only to fall back with greater force. Destroying, consuming the universe for all time.